What do you spy with your little eye? Who could it be? Hmmmm. Six legs... thin wings... two antennae...? That could be a lot of crawly critters. But NINE black spots? Which big-time bug boasts black spots? AH HA! That would be the beneficial and beloved LADY BUG! Steve Jenkins' and Robin Page's forthcoming nonfiction nature book, Who Am I? 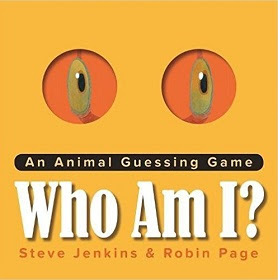 An Animal Guessing Game (Houghton Mifflin Harcourt, 2017) boasts an animal identification game with five or six salient creature features by which to focus in on the correct critter, from frog to flamingo, crab to rabbit, be it amphibian, bird, crustacean, insect, or mammal. Realistically but whimsically illustrated by Steve Jenkins'inimitable paper collages and narrated by Robin Page's simple read-alone text for each mystery creature, the book provides two pages of illustrated clues, followed by a page turn to a double-page spread of the complete animal in motion, from a crab grabbing for a minnow to a bunny rabbit, bouncing off-page with a crunchy carrot on board. Fun to read to one kid or a class, as an initial introduction or a quicky quiz for savvy students, this book is perfect for young preschool or primary-grade nature science students, equipped as it is with am appendix of additional fun facts about each animal and a brief bibliography for older students looking for the requisite "several sources" for their research reports. And with its two die-cut eye holes in the cover, everyone can get ready to spy out the next "undercover" animal.